November 1! I can't believe how fast this year is passing. Wasn't it just New Year's Day?? This year I'm going to do it here because if you want to rise up out of the muck one of the fastest, easiest ways is to be grateful, even for the muck itself. It's super easy to be grateful for all the good stuff. But can you find something to be grateful for in the crap? The traffic you sat in on your way to work? The power that was out because of the storm? For example, when Shawn was paralyzed, how could I be grateful for anything? Well, I was grateful for a lot. Most importantly that he was alive! Because that infection could have killed him given another day or two. So here we go ... Day 1 of a month of Gratitude ... today I'm grateful that when our power was out because of the storm this week it was cold outside. Yes, I'm grateful that it was cold outside because that meant the cooler of the few perishable items I wanted to try and save sat outside in a big old natural refrigerator. And that meant that when we had no power to cook I was able to eat leftover salad! Yes, I was bundled up, shivering but at least I had lunch! 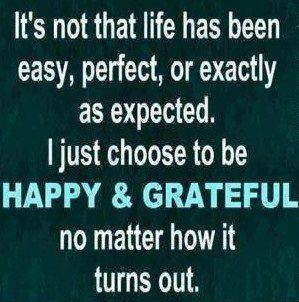 And of course it's ok to be grateful for the good stuff! And with that I'm super, super grateful that our power came back on after a mere 24 hours.